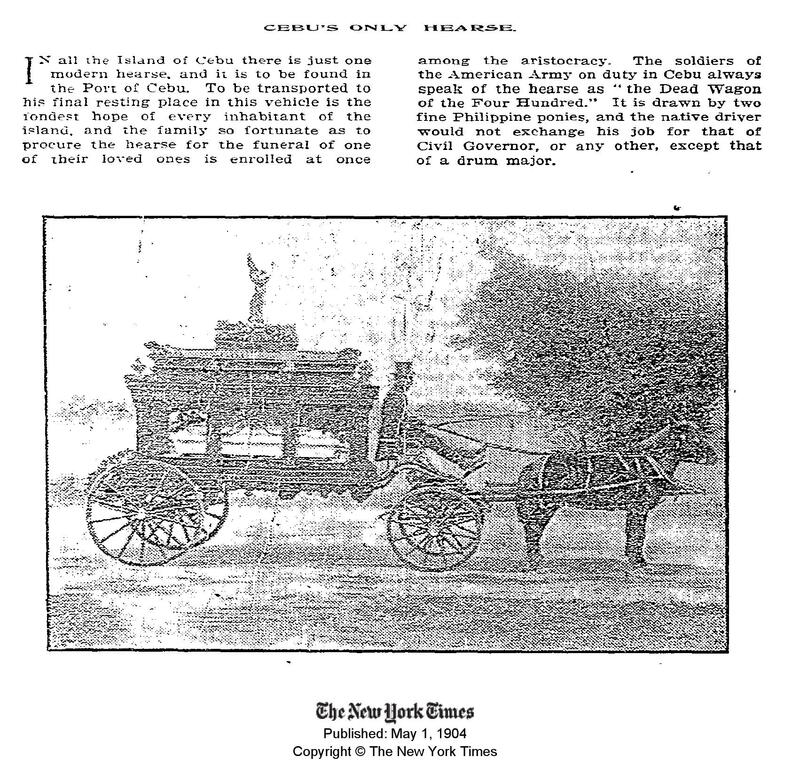 From the archives of The New York Times comes this curious piece, published on May 1, 1904, titled “Cebu’s Only Hearse”. If we can believe the account, there was, in 1904, exactly one hearse in the entire island of Cebu to transport the dead to their graves, and the service was such a privilege that everyone was dying (literally) to get it. Those lucky enough, the article claims, are “enrolled at once among the aristocracy” (posthumously, naturally, but we’re guessing it was never too late to join the upper crust even when you were about to enter lower ground). The story is obviously apocryphal because it also says that the hearse’s “native driver” cherished his position so much that he “would not exchange his job for that of Civil Governor, or any other, except that of a drum major.” That’s when you know the article probably was written in jest. Because everyone wants to be Governor, right? No? The evening we arrived in Kyoto, it snowed. The streets were empty. The parked bicycles gathered snow. In the morning, the snow had stopped, but covered the temple roofs. And traced the lines and circles of Zen gardens everywhere. If any Juan can fly . . .
My tweet last week about Cebu Pacific’s free walking tour of the Mactan Cebu International Airport tarmac provoked some angry reactions from friends who at one time or another must have had participated in it. So since I’m always optimistic about the airline that carries the name of my province and since we can’t sue to have our province’s name removed (we can’t? ), I’d like to suggest some slogans for our dear Cebu Pacific, to reflect the mood of the times. Especially the mood of my angry friends who keep taking part in that walking tour. Anyway, “Now any Juan can fly.” is getting a bit old, and overtaken by PAL’s “You’re not just any Juan, you’re my PAL”. 1. If any Juan can fly, then surely they can walk. 2. Cebu Pacific. We walk the walk. 3. At Cebu Pacific, we walk the extra mile. 4. The ancient truth still holds. A journey of a thousand miles begins with. . .
5. Not every Juan is Tamad. 6. We may not be Asia’s first. But no other airline makes you feel how it was back then. 7. Now every Juan can fly. Just not immediately. A riot erupted at the taxi stand of one of the bigger malls in Cebu today, resulting from confusion as to who should get the next cab first. A man who was second in line insisted that he should go first, citing the House prosecution panel’s preferred order of trial, and explaining that this would, moreover, produce reform in the administration of taxi lines at malls. The woman who was first in line refused to budge, saying that this violated due process and “fare play”. The mall manager intervened, ruling that the the woman should get the cab, but a member of the mall’s board of directors insisted that the question should be put to a vote. The board sustained the mall manager’s ruling. This should have settled the question but another man, who was seventh in line insisted that he should get the next cab after the man who was second in line. Trouble ensued when the third, fourth, fifth and sixth in line protested. Mall management has enlisted the services of their janitorial services department to settle the dispute. The latter have now taken to calling themselves “janitor-judges”. The blog has a new name. 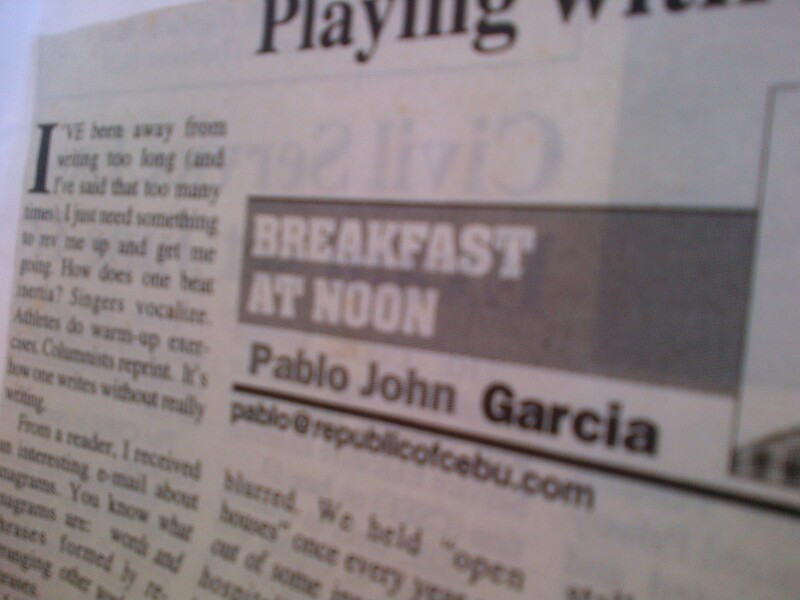 Originally, the blog was based on “Breakfast at Noon”, a regular column (OK, my editors then thought I was really stretching the definition of “regular”) which first came out in early 1998 when Cebu Daily News first saw print. In 2004, the column moved to SunStar Cebu and ran until 2005, when I had to stop writing and start running. Recently, I found out that sometime in 2006, an American author published a book with the title “Breakfast at Noon” and had taken the domain breakfastatnoon.com. 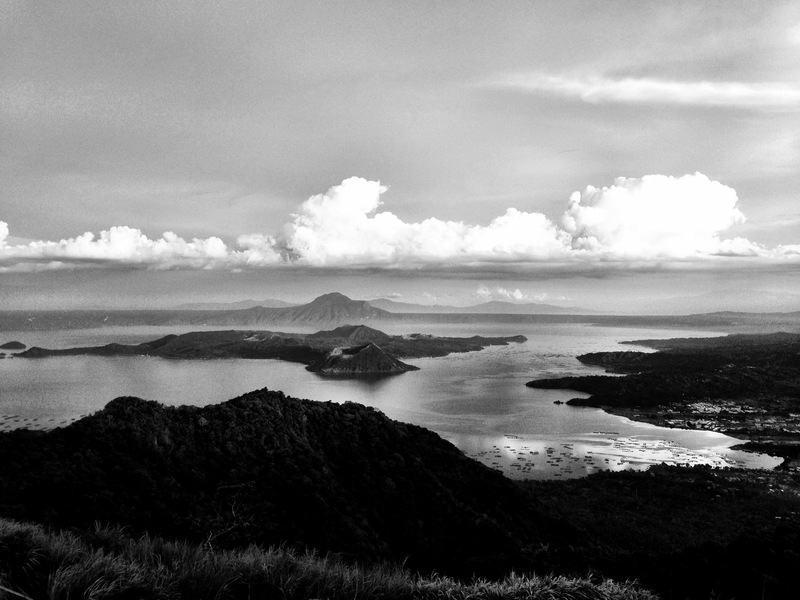 To avoid confusion, this blog is now known as Cebuyas.com. Which is just as well, since the original meaning behind the title 14 years ago has been lost. Nobody my age really wakes up at noon anymore, even if we wanted to. Age is an alarm clock and it doesn’t have a snooze button. I thought I would never change my views on the impeachment of CJ Corona. I had refused to sign the complaint (or that paper which they assured us would soon be attached to the complaint they assured us was already there), and I thought that was that. No to impeachment. Not the daily barrage of reports in print, on radio and broadcast could move me. The text messages, which have kept coming despite my recent conversion, all reveal one thing: That CJ Corona is evil, and that all institutions of government, and the social fabric itself, would crumble if he is not convicted. I suspect the text messages are just being modest and that it reasonably may be inferred that the non-conviction of CJ Corona would accelerate the Mayan Calendar, so that the world would end if CJ Corona is not convicted, or on December 21, whichever came first. 1. I learned that my cell number was entered in a “U.K. international lottery” and I had won 1 million GBP, and that I could get it by simply giving up some minor personal data like credit card numbers. 2. My number even won, I learned, in a local lottery, because it was apparently entered by someone who wanted me to win 1 million pesos, which I did. I just have to deposit 10,000 pesos to the account of this wonderful bearer of good news. 3. It turns out I don’t have to take all my doctor-prescribed medicines. Some unknown number sent me a text message of this herbal pill that cured everything. I just had to buy an introductory pack for 9,000 pesos. And there’s a lot more. Who knew that the Anti-Corona texters would change my life forever? If they really wanted to make it easier for our bladders to let go, they should have put up huge pictures of waterfalls. Or pictures of huge waterfalls, for those who have particular difficulty going with the flow. The Niagara. 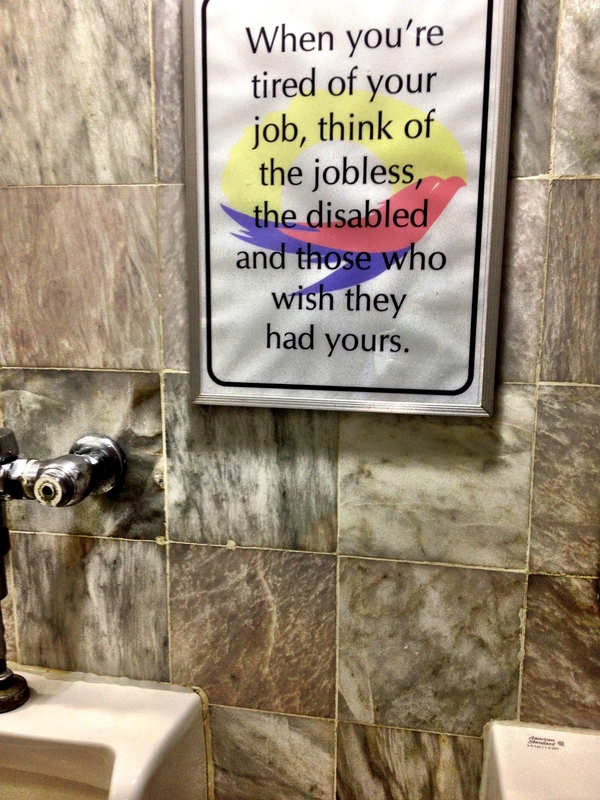 In restrooms all over NAIA Centennial Terminal, inspirational quotes are hung over urinals. It’s like Paulo Coelho wagging his finger at you while you’re trying to hold your own, so to speak, or — if you’re among the lucky ones — finally done with it, and wagging success with your fingers. But Paulo Coelho is for a different kind of rut, like when you don’t know what to say on Twitter. For help with what doctors call, shyly, “urinary hesitancy”, I believe words — even if they tell you it’s your destiny to be right there at that particular urinal at that particular juncture in time — hardly work. Pictures are better. Better yet, sounds. Restrooms should pipe in ambient sounds as a mandatory accessibility feature, right up there with handle bars. Especially those that approximate the shwishing sound your mother made when she tried to coax your hesitant stream when you were a child. I still remember those shwishing sounds. I can still hear them now. And now I really have to go. . .